locally sourced, small batch, hand made, life-affirming and, most importantly, crazy delicious ice creams from spokane, washington. "We hired Annie to bring her adorable ice cream cart to our wedding as a surprise treat for our guests, and it was a HUGE hit! Everyone is still talking about it. Not only was the ice cream to die for (sooo good! ), but Annie herself is so sweet and wonderful to work with." Find your favorite pints at My fresh basket and rocket market! 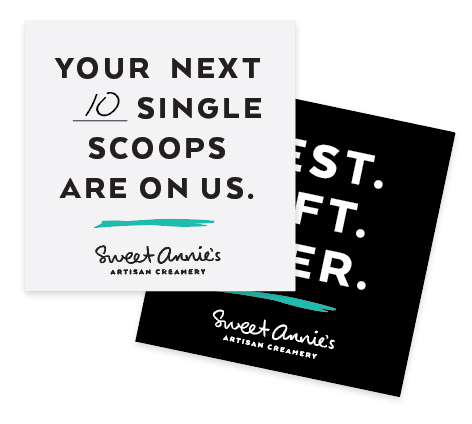 with Sweet Annie's Gift cards.